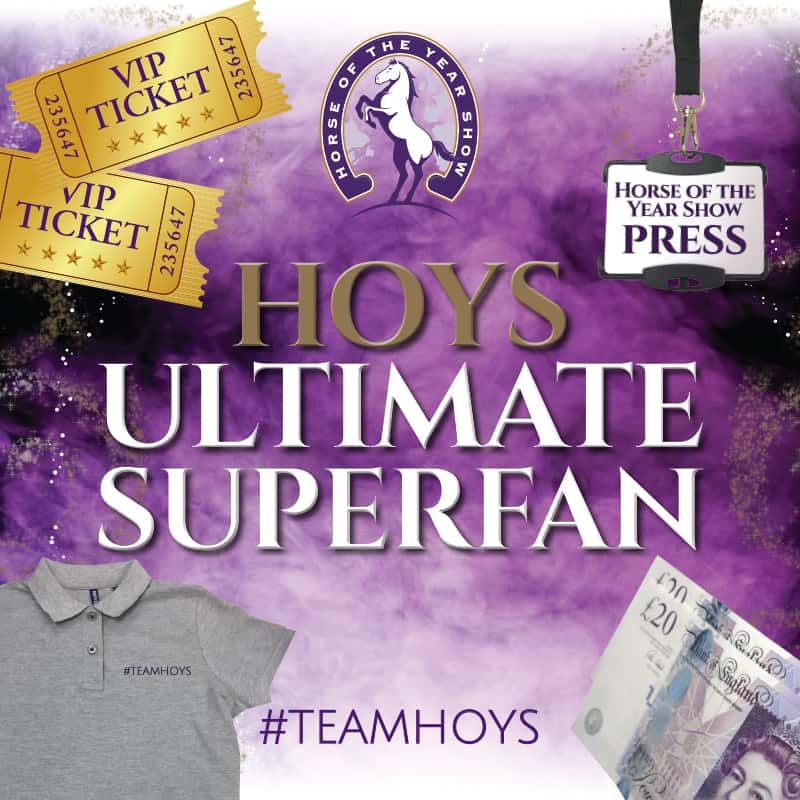 Think you’ve got what it takes to be a HOYS Superfan? We are looking for six enthusiastic, horse-loving and social media savvy individuals to help us spread the news about Horse of the Year Show 2019! Horse of the Year Show (HOYS) is one of the longest standing horse shows in the UK and is the biggest week of the year for equestrian entertainment. Returning to The NEC Birmingham this October, the event will showcase national and international showjumping classes, the finals for the Pony Club Mounted Games Prince Philip Cup, and will see the best of British show horses come forward for the finale to the showing season. So whether you are a showjumper, a pony clubber or a showing enthusiast, we have you covered. Ever wondered what it is like to spend a day backstage with the Press Team at HOYS? Well now is your chance! As part of the prize, you will be invited to spend a day backstage with our HOYS ambassador Hannah Eccles. You will be mingling amongst well-known equestrian journalists from the likes of Horse & Hound, interviewing riders, taking shots for social media, speaking to some of the other members of our team and getting a real feel for what it’s like to put on one of the biggest horse shows in the UK. And as if that isn’t enough, you and a friend will then be invited to enjoy an evening in hospitality, soaking up the atmosphere and enjoying a well-earned treat. The runners up will also each receive a pair of tickets to come along and enjoy the show on the Sunday evening for the Gala Evening Finale. • The winning Superfan must have sold a minimum of 10 tickets in order to claim their prize. Applications to become a HOYS Superfan will close on 30th April 2019 and winners will be selected by a panel of Grandstand Media Ltd employees. The lucky six winners will be contacted by Friday 10th May 2019. Good luck!